Located in Utah, the Great Salt Lake is the largest saltwater lake in the Western Hemisphere, but years of drought and over-irrigation of nearby rivers have resulted in dramatic declines in water levels. New satellite photos reveal the disturbing extent to which this ecologically sensitive lake is shrinking. Typically, this iconic lake covers an area of around 1,700 square miles (4,400 square kilometers), so it’s not going to disappear any time soon. But the lake is drying up and shrinking; in October 2016, the Great Salt Lake reached its lowest level in recorded history, covering an area of 1,050 square miles (2,700 square km). Water level height is currently averaging around 4,191 feet (1,277 meters), which is a reduction of 11 feet (3.4 meters) since 1847. The lake’s volume has shrunk 48 percent over the course of this time—the result of a recent five-year drought in the region, higher than normal temperatures, and farming practices that extract water from feeder river systems. The Great Salt Lake is the world’s eighth-largest terminal lake, i.e. lakes that don’t leak out any water other than through the process of evaporation. This is why the Great Salt Lake has such a famously high salt water content. But it’s not “America’s Dead Sea” as popular culture would lead us to believe. This critical water basin provides habitat for millions of native birds, brine shrimp, shorebirds, and waterfowl. 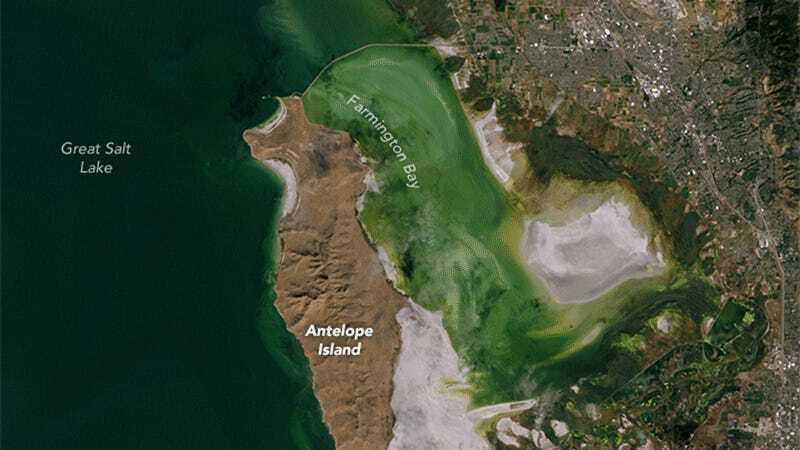 Satellite photos taken by Landsat 8 show recent changes in the Farmington Bay basin of the Great Salt Lake. More than three-quarters of the lake bed is now exposed in Farmington Bay. The increasingly exposed shoreline has resulted in more and larger dust storms, making it more difficult for companies to get the water required for extracting salt and other minerals. Recent research shows that river flow into the basin has dropped nearly 40 percent since the mid-19th century. The state of Utah has asked its citizens to cut back on water use, but that only accounts for eight percent of total water use in the region, the vast majority (63 percent) going to farming. The challenge moving forward will be to convince farmers to do more with less, given a growing population.